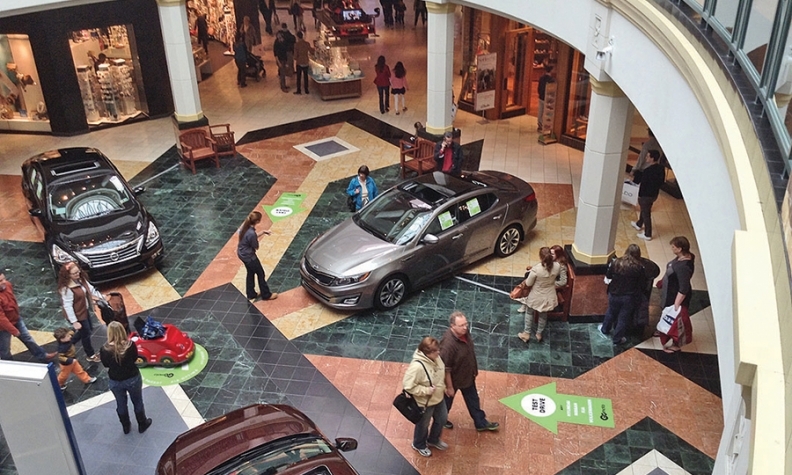 GoMoto displayed cars at the King of Prussia Mall outside Philadelphia. Nearly nine in 10 consumers say they wouldn't buy a car without test driving it first. But a substantial majority -- 70 percent -- would like to be able to test drive multiple vehicles across brands at a single location, without the pressure of a salesperson riding with them, a study of car-buying preferences found. According to the study, released Monday by the car-shopping site Autotrader, most consumers said they would visit dealerships more often -- and even buy vehicles more often -- if the shopping experience were improved. In addition to a more low-pressure test drive environment, the study recommended giving consumers more freedom to initiate negotiations on their own terms, shifting more financing paperwork online and offering a broader network of service centers that would honor warranties. The results were based on a survey of 4,002 car shoppers and buyers from June to October 2014, as well as focus group interviews. Of those surveyed, Autotrader said, only 17 liked the car buying process the way it is. "While there is good work going on right now to adapt decades-old sales processes, consumers are telling us that we as an industry are not moving fast enough," Jared Rowe, president of Autotrader, said in a statement. Dealerships, he added, have much to gain "by recognizing-and embracing-the need for change." Autotrader said its findings disputed the notion that customers prefer an entirely online, no-haggle experience: 84 percent of respondents said they want to buy a car in person, and more than half said they preferred a negotiated price over a flat price. That held true even for millennials and women, Autotrader said. And while low prices are important, the study said, they aren't paramount. Most consumers would go the extra mile for a certain type of shopping experience or to work with a good salesperson, even if it meant sacrificing on price. Fifty-four percent of respondents said they would buy from a dealership that offered them the experience they wanted, even if the price wasn't the lowest. Dealers could improve that experience by cutting down the time spent at the dealership on completing financing paperwork. Nearly three-quarters of respondents preferred to fill out credit applications and other forms online. The idea of a one-stop, multibrand test drive center isn't a novel one. In 2013 and 2014, a lead-generation startup called GoMoto launched such an operation at two Philadelphia-area shopping malls in partnership with local dealers, charging them as much as $1,250 to display a vehicle at the sites. The project faced complaints from manufacturers that the test drive centers functioned too much like retail outlets.